Shortly after teasing via twitter, 2K has shown we are now getting a return to Rapture via iOS systems. 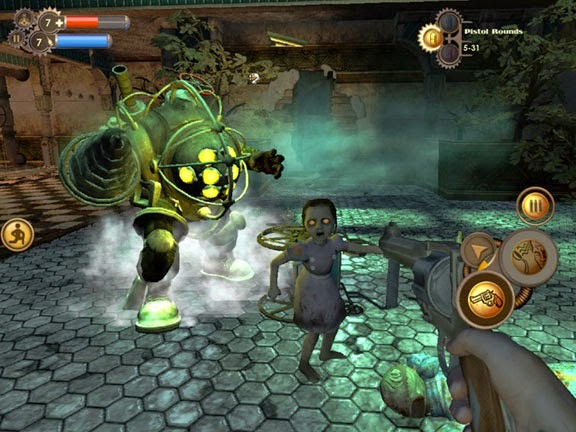 The tease was hinting a literal return, because iOS users get the 2007 original Bioshock, albeit with some clear compromises in quality. The frame rate looks a bit low, some fine detailing work seems missing, and the right side controls appear a bit questionable in more than single person battles from the video. There are currently no plans for an Android port. Which also makes me question, why aren't we PS Vita users receiving something? It really is a dystopian location. This is doubly disturbing because I use Android and love my PS Vita(s). After Infinite, there's certainly an opportunity to open many more stories in this franchise. In the Bioshock universe there's always a way. So far there is neither a definitive release date nor price, although "Summer" and a "premium" price have been stated by 2K.